by hongkonggong, August 19, 2011. Many animated Japanese TV series are based on serialized comics that have already proved themselves in paper form. The relationship between comic and TV series varies; some animation studios stick close to the original while others run off with the plot and its characters, hoping to increase their chances for a blockbuster hit. Usually when studios take the latter route, the results are disastrous. In the worst cases, they distort and muddy the originally successful premise. In more benign cases, they stretch out the runtime by implementing a sequence of unnecessary plot detours. 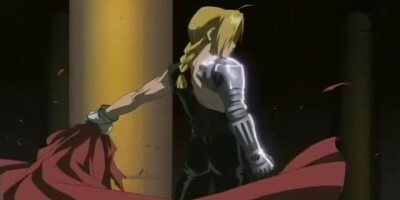 In the case of the 2003 adaptation of Full Metal Alchemist (鋼の錬金術師), Bones studio distorts the premise and plays with the plot, but they manage to create a far better product. 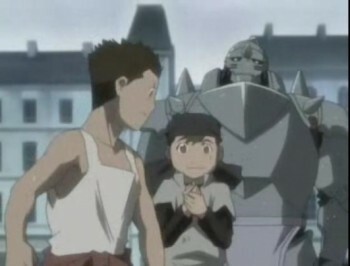 Hiromu Arakawa’s Full Metal Alchemist (the original comic) follows the story of two teen brothers on a quest to recover their bodies after an experiment in alchemy goes horribly wrong. Spurred by their loss, the brothers set out on a journey to find the mythical Philosopher’s Stone, hoping it will help them with their problem. While Full Metal Alchemist is, at its core, a young adult fantasy novel about teen alchemists, Arakawa also touches on plenty of dark themes over the course of the story. To begin with, the brothers are haunted by their own failure to themselves and to each other. Later on, as the plot thickens, Arakawa continues to probe the extremes of sin and redemption with an expanded cast of characters and web of interlocking events. Ironically though, it is the candy-coated parts of the 2003 TV adaptation that shine the most. Tasked with adapting an unfinished story into a TV animated series, Bones studio bought themselves time by drawing out the introduction and slipping in extraneous plot arcs. For a moment, it almost seems like they want to turn the sprawling epic into an infinite repeatable pattern (look for magic stone, fail to find it, look again in the next episode). They don’t and, taking a cue from the comic, they let the story spiral in complexity. By about the 25th episode, with the unfinished comic as a wayward guide, the TV adaptation’s plot turns into a tangled web of ill-fitting conspiracies, coincidences and character histories. But it is the episodes before the series spins out of control that command the most attention. During the first ten episodes of Full Metal Alchemist, Bones studio really draws the viewer in and endears them to their two heroes. They setup the the two brothers as valiant but fallible, teetering them between being foolhardy children and weathered adults. At the same time, they introduce the magical world of alchemy through a series of examples, each one revealing more than the last, building upon one another. Where Bones shines and really deviates from the comic though is in their measured pacing, warm visuals and melancholic soundtrack, all of which work together to paint a lush and inviting world. For example, the amount of time devoted to the brothers sitting on the train borders on wasteful but is worth every second because it eases the viewer into the idea of the journey, in this case, a journey without a fixed destination and home to return to. With Full Metal Alchemist, I was hooked by the fifth episode. By episode ten, I was personally committed to the brothers and their quest. So when the 25th episode and its subsequently disastrous plot set in, I was barely phased. I had invested so much in the two brothers by then that I was secretly routing them for under my breath, bad plot or not. I acted similarly when the movie sequel to the series, Full Metal Alchemist the Movie: Conqueror of Shamballa, arrived at my local cinema. The plot was incoherent and atrocious but I loved it all the same. Then a funny thing happened. 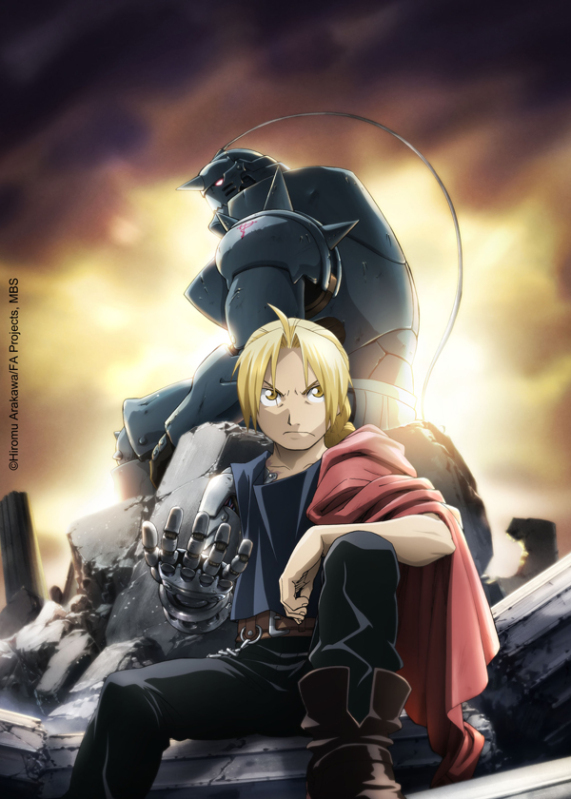 In 2009, the Full Metal Alchemist franchise was doing so well that they decided to remake the animated series, except this time they would closely follow the plot of the comic (which was nearly done by then). As a Full Metal Alchemist fan, I dived in, happy to consume more and knowing that I had been swindled out of a proper ending the first time around. The overall plot of the 2009 adaptation is better, darker and more consistent with itself, but I found myself less engaged in the new series. (I did, of course, still watch all of it.) It felt rushed. Every episode was packed with several plot points to advance, and the moments of calm and endearment that made the 2003 adaptation so powerful were notably absent. Yet it was hard to argue against the robust plot structure and the ultimately more satisfying ending. Not to mention the advances in animation that had been made in the intervening six years. The dilemma is then, which TV adaptation do I recommend? The 2009 one definitely ends better and portrays a more believable world. But the 2003 one sets up the premise in a much more compelling way and really lures the viewer in. My solution is to watch both but not all of them. Watch the first 25 episodes of the 2003 adaptation, and then switch over to the 2009 version. When switching to the latter, start from the beginning: there’s some overlap but the way events unfold is sufficiently different that it’s worth catching from the start. Be warned, since I watched both of them when they were released, this is an untested solution. So please let me know if you do go through with it and if it works as I am hoping it will. Article by hongkonggong, August 19, 2011.